The Millennium Items are seven treasures created from an ancient spell found in the Millennium Spellbook in order to keep the ancient magic of the Shadow Games locked up forever. The Millennium Stone in the village of Kul Elna is the origin and resting place of the seven items, and also where Akhenaden sacrificed ninety-nine humans in order to create them. The Millennium Items are also mentioned in the description of "Sengenjin" as well as being wielded by "Ma'at" in the Yu-Gi-Oh! GX manga. Grants the one who solves it intelligence and "power of darkness"
Finds out how much darkness is in a person's heart. Allows the wielder to "redecorate" the soul to make anyone their puppet. Spellbook - the book that Ahkenaten used to create them. Feather of Ma'at - a tool used by the Pharoah's Priests to judge the hearts of criminals. Pyramid of Light - an item containing Anubis's soul, greatly resembling the Millennium Puzzle. Quantum Cube - a mysterious item (bearing an Eye of Anubis like the other Millennium Items) possessed by Aigami in Yu-Gi-Oh! The Dark Side of Dimensions, and is identified as the "eighth Millennium Item". Aigami primarily uses it to transport people to another dimension known as the Plana, but it can also be converted into a unique Duel Disk which he can use to Duel with. The Millennium Items grant their chosen owners access to ancient magic to use in Shadow Games. The most standard are granting a wish when being acquired, communicating with spirits (Duel Monster or human), casting Penalty Games on the loser of a Shadow Game that the owner played against. When a Shadow Game starts, using the magic of the items, players would send themselves into an alternate dimension where their Duel won't be interrupted, and where cheating is forbidden, punishable by death. Outside of a game, in addition to their unique abilities, the items' power of the Shadow Games also allow the owners to harness dark magic that they can defend themselves with. The power within the Millennium Items lets their holders perform feats like: putting people to sleep, cloaking himself and others from sight, interfering with other Shadow Games, remote-viewing, etc. The items also give their owners protection from harm, and from other magic. In an early chapter of the manga (Duel 14: The Man From Egypt (Part 2) in Volume 2: The Cards With Teeth), Shadi gives a vague explanation about why the Millennium Items were created. According to this story, the relics were created by the Pharaoh's magicians of Ancient Egypt in order to punish thieves who tried to rob the Pharaohs' tombs. Shadi says this is written in the Pert Em Hiru, or Coming Forth By Day (the Egyptian title of The Book of The Dead). Later chapters of the manga (published as Yu-Gi-Oh! Millennium World in North America) then give a more detailed lore about their origin. With Egypt under threat from invading armies 3,000 years ago, the Pharaoh Akhenamkhanen sought to protect his land through mystical means, and laid down the command for the seven magical Millennium Items to be forged, based on an ancient spell found in the Millennium Spellbook. Akhenamkhanen's brother, Akhenaden was charged with creating the items, but Akhenaden refrained from informing his brother that in order to do so, 99 human sacrifices were required. The village of Kul Elna became the victim of the Pharaoh's unwitting decree, as Akhenaden had them slaughtered, their blood, bone and flesh melted in with the gold that was cast in the mystic rite that formed the items. With Akhenamkhanen possessing the Millennium Puzzle, the remaining six items were entrusted to his high priests the Sacred Guardians: the Millennium Key to Siamon, the Millennium Eye to Akhenaden himself, and the Millennium Necklace, Rod, Scale, and Ring to the other four priests (the predecessors of Isis, Priest Seto, Karim, and Mahad). Using the Items' combined power, an army of Duel Monsters was summoned which repelled the invading foes of Egypt. However, upon discovering the dark truth behind the Items' creation, Akhenamkhanen attempted to atone by offering his soul up to the Egyptian Gods as penance, sparing his son, Pharaoh Atem from any future retribution for his own indirect actions. The Yu-Gi-Oh! first series anime just makes use of the story depicted in the early chapters of the manga due to its small coverage of the series, while the Millennium World arc of the Yu-Gi-Oh! second series anime follows the detailed version of the manga's late chapters (the dub cuts the mention of the villagers dying, but still specifies their souls were used). When his father died, Pharaoh Atem was given the Millennium Puzzle, and in time, Siamon Muran relinquished the Millennium Key to Shada. The Millennium Rod was given to a young priest named Seto, who (unknown to everyone) was actually Akhenaden's son. Seto became a strong friend of Atem, though both young men remained unaware that they were cousins. Thief King Bakura, the sole survivor of the slaughter in Kul Elna, stole the holy DiaDhank from the tomb of Akhenamkhanen. By using it, Bakura could summon the ka, or soul, sealed in slates in the tomb of Akhenamkhanen and the demon Diabound, which created by the ka of the deceased people in Kul Elna (originally, a Millennium Item was needed to summon Ka, except your own). After failing to beat Atem, he defeated Mahad and acquired the Millennium Ring. Then, using the Millennium Ring, Thief King Bakura injected evil thoughts into Akhenaden's Millennium Eye to corrupt his mind. Akhenaden wanted his son, Seto, to become the new Pharaoh, so he helped Bakura defeat the other priests and Atem, then he placed the Millennium Items upon the stone slab to summon the Dark God Zorc. While Zorc attempted to decimate the planet, Atem used his own name and the magics of the Shadow Games, within the Millennium Items, sealed Zorc and his own soul within the Millennium Puzzle, wiping his memory so that he could not recall it, so that the binding might never be undone. With Atem's eventual death, the Millennium Puzzle was entombed along with him in his crypt in the Valley of the Kings. In a chamber beneath the village of Kul Elna, a sculpted stone rested - it read "Should the seven Millennium Items be placed upon it, along with the eighth key, the Pharaoh's name, Zorc would be free again". The magic of the Shadow Games was unleashed when the Millennium Puzzle was solved by Yugi Muto in the present day, and he embarked on a series of adventures that eventually resulted in the locations of the Millennium Items being revealed, and the three Egyptian God Cards coming into his possession. Placed on a stone tablet (the Tablet of Lost Memories) that professed to chronicle a battle between the Pharaoh and Seto, the cards and the Puzzle opened a gateway to Ancient Egypt, through which the soul of the Pharaoh was pulled. Back in his original body, but still lacking his memories, the Pharaoh was reunited with his priests, and Akhenaden's treachery was revealed as the Spirit of the Millennium Ring, which had also traveled back in time, stole the Items from their owners and used them to resurrect Zorc, only to have him be eradicated for eternity at the hands of the union of the three Egyptian Gods, The Creator of Light. Back in the present, following Atem's defeat at the hands of his vessel, Yugi Muto, in the conclusion of the Ceremonial Battle and the series, the Millennium Items, placed onto the tablet just before the duel began, would open a gateway to the afterlife, allowing the Pharaoh Atem to be finally at rest. Afterwards, the temple would then crumble, sealing all 7 Millennium Items deep underground until Kaiba digs them back up in The Dark Side of Dimensions. 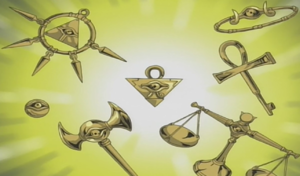 The items as they appear on the body of "Ma'at"
In the Yu-Gi-Oh! 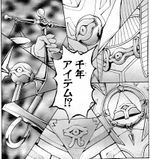 GX manga, the Items are wielded by "Ma'at", an incarnation of the Egyptian God with the same name. "Ma'at" uses the power of the items that priests had sealed in the White-Feathered spirit to defeat Tragoedia and allow Winged Kuriboh and Light and Darkness Dragon to seal him permanently. ↑ Yu-Gi-Oh! GX Chapter 64: "Beyond the Struggle..."
This page was last edited on 5 October 2018, at 02:42.